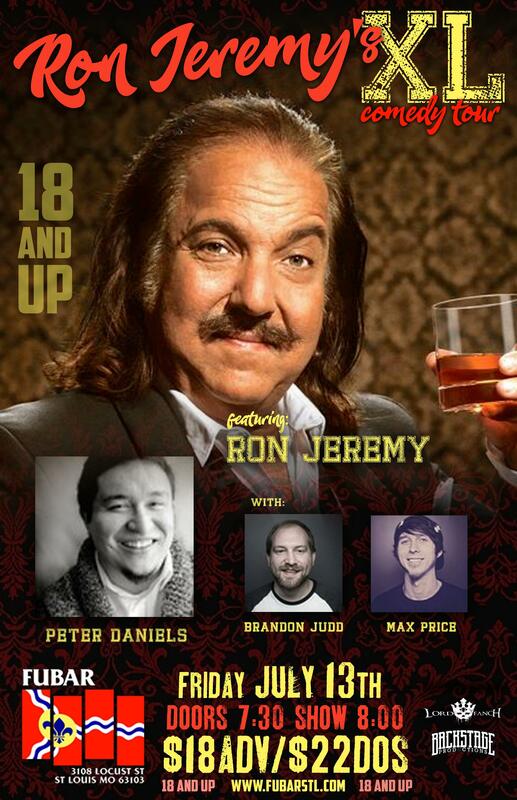 Former Adult Film Star Ron Jeremy will be appearing at Fubar on Friday night as the host of his XL Comedy Tour. Jeremy is without a doubt the most recognizable name of the Adult Film Industry, having appeared in well over 2,000 films. Besides being a legendary adult film star, Jeremy has appeared in mainstream films, television shows, music videos and even written his own biography. Jeremy spoke highly of St. Louis when he took time out of his busy schedule to talk to ReviewStl’s Jeremy Housewright. Jeremy also spoke of making commercials here in St. Louis. Jeremy re-enacted the well-known carpet commercial by sitting on the carpet similar to what Becky would do in her commercials. As far as Jeremy’s XL Comedy Tour goes, he will be joined by Peter Daniels, Brandon Judd, and Max Price on Friday night at Fubar. Jeremy has been performing stand-up for a number of years, as he got his start when he worked as a waiter in the Catskill Mountains of New York. Jeremy was bit by the comedy bug while watching other comedians perform. Jackie Mason, Jackie Gayle, Dom Deluise and Rodney Dangerfield were just a few of the comedians that Jeremy mentioned having seen perform. Most people may not realize that Jeremy received his Master’s in Special Education. As far as Jeremy’s favorite comedian, he acknowledged the late Sam Kinison. When it comes to inspiration for material, Jeremy said he doesn’t have to look very far. Jeremy will undoubtedly talk about his life among other topics on Friday night at Fubar. Tickets are still available for Ron Jeremy’s XL Comedy Tour at Fubar. The event will start at 8 p.m. on Friday night. For ticket information visit Fubarstl.com or etix.com.